British hero saved Jewish children from the Nazis, remained quiet over the lifesaving mission for 50 years. 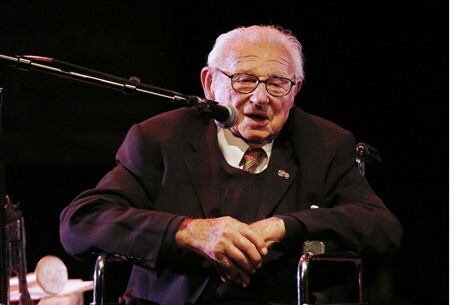 Englishman Nicholas Winton, who saved hundreds of Jewish children in Prague from the Nazis before World War II, will receive the Czech Republic's top honor, its president said Monday. "Your life, Sir Nicholas, is extraordinary for many reasons," President Milos Zeman said in a birthday message to the Briton of German-Jewish origin, who turned 105 on Monday. "It provides above all an example of humanity, altruism, personal courage and modesty," he wrote, revealing the already knighted Winton will receive the Order of the White Lion on October 28. Winton travelled to Nazi-occupied Czechoslovakia - which has since split into the Czech Republic and Slovakia - while a young employee of the London stock exchange. An additional train was set to leave on September 3, 1939, the day Britain declared war on Germany, but the borders were already closed. None of the 250 children were ever seen again. Winton's action earned him the nickname of the "English Schindler," in reference to Oskar Schindler, the German industrialist who rescued hundreds of Polish Jews during the war. Winton kept quiet about his mission for 50 years until his wife found evidence of it in his attic.